Stan Lee spills the beans on a number of topics including working with Hollywood friends, upcoming MCU films, and being a legendary storyteller. The cast and director of 'Thor: Ragnarok' share their tips and tricks on how to talk like The Hulk. Guests included Mark Ruffalo, Chris Hemsworth, Tessa Thompson, Tom Hiddleston, Jeff Goldblum, and Taika Waititi! Thor and The Hulk are a perfect odd couple. Here's what 'Thor: Ragnarok' would look like as a 90's Sitcom. Guests included Mark Ruffalo, Chris Hemsworth, Tessa Thompson, Tom Hiddleston, Jeff Goldblum, Taika Waititi! Stan Lee answers some prodding questions on upcoming Marvel movies: 'Thor: Ragnarok,' 'Black Panther,' and future properties. Looking for movie tickets? 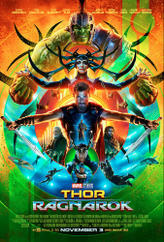 Enter your location to see which movie theaters are playing Thor: Ragnarok (2017) near you.